In just a few short minutes you can turn a 2 Liter bottle or even a smaller 20 oz. bottle into a cute container for gifts. 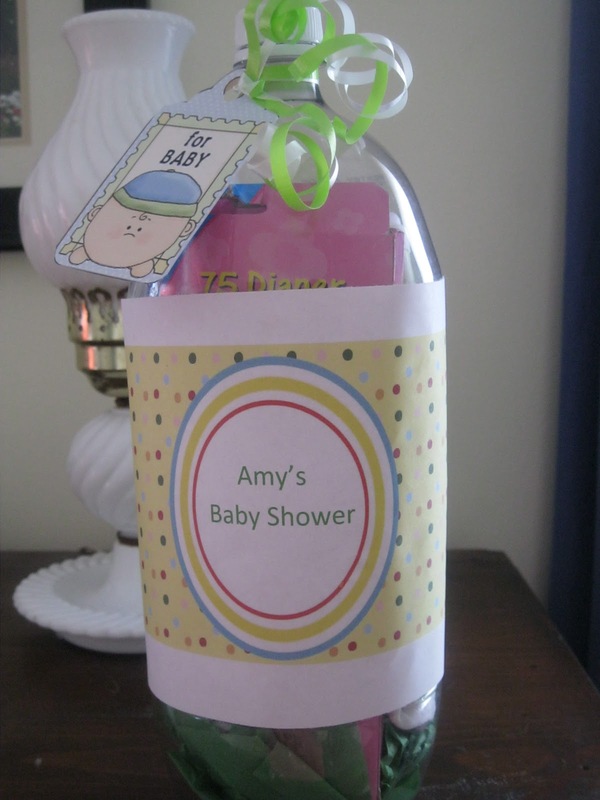 I have a baby shower at work this week, and wanted to put together something cute on a limited budget. This project takes only a few minutes to put together! Jan's tip: I've heard that you can technically ship anything by mail as long as you can get postage on it. Probably has a fee for unusual shapes, but I've heard of people putting a mailing label on the bottles instead of a gift label and mailing vacation t-shirts or birthday items across country. I haven't done it and don't know how your post office feels about it, but would be fun to recieve! 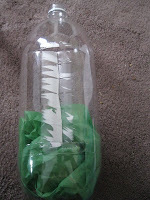 1) Rinse and dry the inside of the bottle. 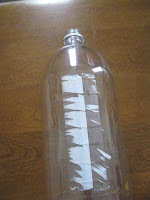 3) Using an exacto knife cut the bottle in the shape of the letter I in the section where the glued down part is showing. I recommend cutting as small an "I" opening as you need to. 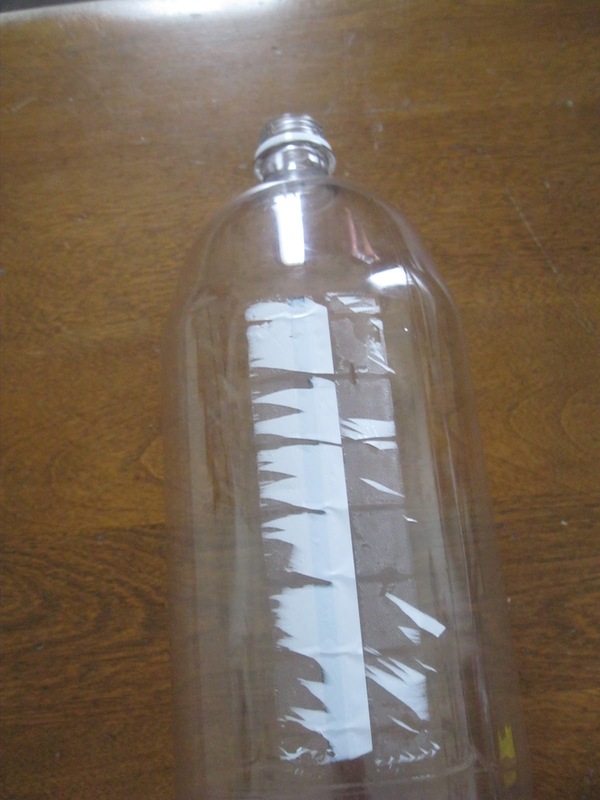 I cut through the whole section where the glued down part is and made a large opening, due to the larger sized gifts I put in the bottle. I don't know if you can see the "I" shaped cut I made in the bottle in this picture. 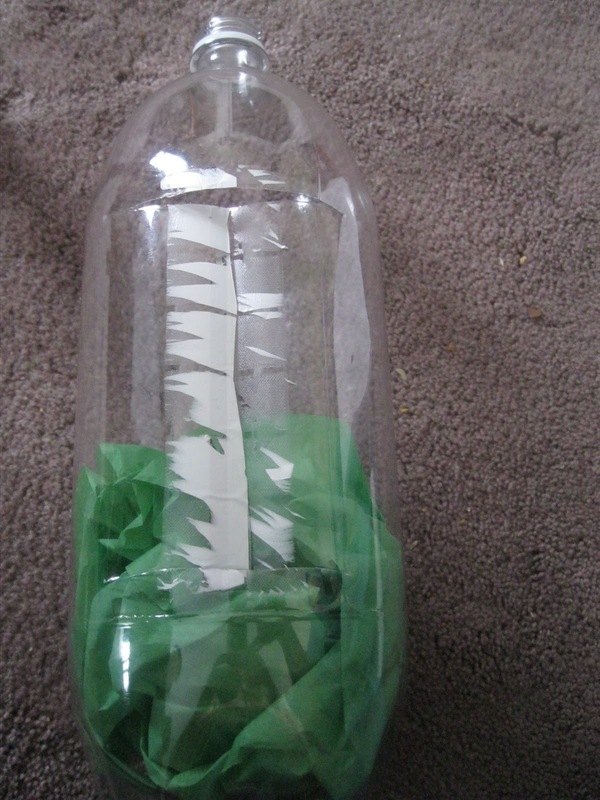 4) Using the opening, put a little decorative paper shreds or colored tissue paper in the bottom of the bottle. then place the gifts into the bottle. I found that it was better visually to place the fronts of the gifts that you want seen towards the back of the bottle face down away from the opening. The opening will be covered up and my label didn't wrap all the way around, so the back of the bottle showed the contents, and I wanted it to not be the backs of the gifts showing. Jan's tip: multiple smaller gifts or clothing that can be folded, rolled, or "smooshed" a bit work best for this project. a T-shirt would work great in a 20 oz. bottle. 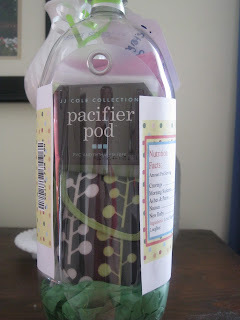 5) Design or find a cute label that will cover the opening you made in the bottle. 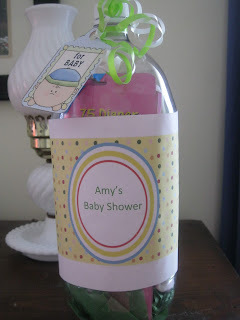 I did a Google search for free baby shower water bottle labels and found a cute one from mypaperlilly.blogspot.com that I could enlarge in Microsoft office word program and add the gift recipients name to. 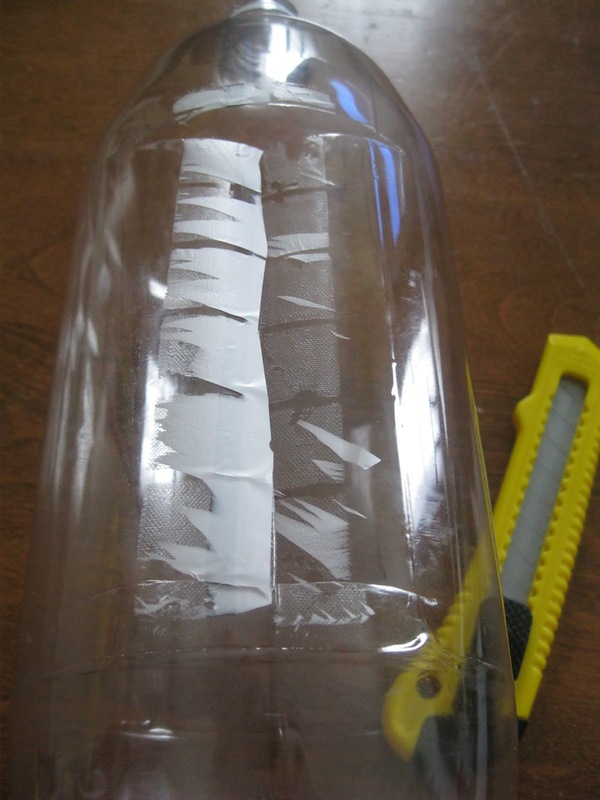 Print out and before cutting it out of the paper, hold it over the opening in the bottle and measure to make sure you don't trim it smaller than the opening. You want to completely disguise the opening. 6) Cut out the desired size of your label and using a glue stick apply glue to the label. Center the label over the opening and glue down onto bottle. If you haven't screwed the bottle cap on the bottle yet, do so now. 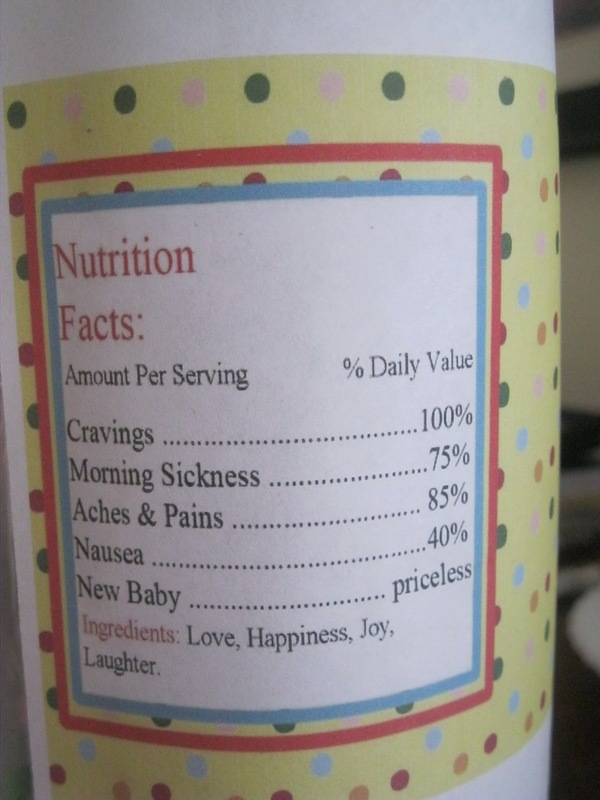 Add cute ribbons and tags to the neck of the bottle. Here's a few pictures of the finished product. Now that's cool! What a fabulous idea! Now that is a fun idea! They'll love trying to figure out how you got them in there! super idea! I've got enough for my gardening project and was wondering what to do with the ones I keep drinking. Awesome, thank you so much! Thanks for the kind words! I appriciate you stopping by! Michele, I hope it turns out great! Let me know. Wow-what a cute idea-I'm your newest follower-stop by for a visit!! Thanks Claire! I'm on my way to visit you now! Thanks for introducing yourself! Thank you so much! I am excited it is being featured and will grab a button!